FoS2015 Phoenix leads Chutzpah38 (left) - Picture by Teri Dodds. The Victorian Sydney 38 fleet is tuned up for the class’ upcoming national title having contested the Festival of Sails series across a full spectrum of conditions over the Australia Day long weekend. Brenton and Jen Carnell’s Phoenix from the host Royal Geelong Yacht Club clinched the Morris Finance one design victory on the final blowy day, Sunday January 25, 2015, the perfect confidence shot for last year’s national runner-up. Second by four points at the Festival was Sydney 38 Class Association President Greg Clinnick and co-owner of Audacious, Paul Holden, from Royal Brighton Yacht Club. 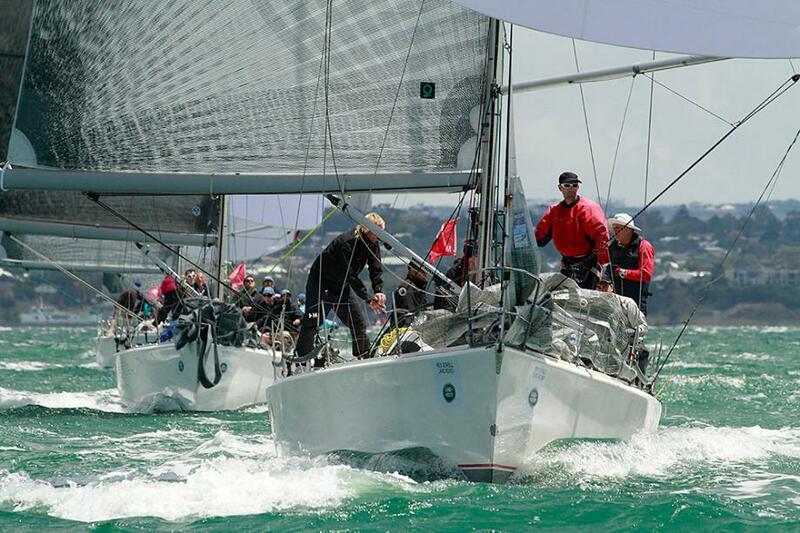 Third was Bruce Taylor’s Chutzpah38 from the Royal Yacht Club of Victoria. The home of one design racing on Sydney’s northern beaches, the Royal Prince Alfred Yacht Club, is hosting the once a year showdown over three days, February 20-22, 2015, and five teams from south of the NSW border have the championship in their sights. Clinnick reckons the 14 Sydney 38s already nominated for the Grade 1 regatta could grow as high as 20, and gauging the interest from Sydney 36 owners it looks like up to five will be scored in their own division. The Sydney 38 One Design Australian Championship falls under the overarching Performance Boating Sydney Yachts Pittwater Regatta. Sydney 36s (PHS) and Sydney 32s (PHS) plus an EHC handicap division for any other Sydney Yacht owners who wish to compete complete the box set. Following on from this month’s ISAF Sailing World Cup, Sydney based Paralympic SKUD gold medallist Dan Fitzgibbon will transition to the helm of his Sydney 38 Another Challenge in the run up to his first crack at an Australian class crown. Fitzgibbon’s current world cup campaign in Miami is just one of a raft of international events that takes the busy Australian Sailing Team athlete and 2012 London gold medallist far from home seeking re-qualification with his crew, Liesl Tesch, for next year’s Rio Paralympic Games. Missing the camaraderie that comes with a larger yacht crew prompted the quadriplegic sailor to approach the RPAYC and the class association about purchasing and modifying a Sydney 38 so he and other disabled sailors could integrate into existing club racing programs. RPAYC not only embraced the concept, they went way beyond, launching their own Integrated disAbled Sailing (IdS) program with the support of a handful of key club members. “Disabled sailing is usually very segregated,” admits Fitzgibbon. “I train by myself and spend a lot of time overseas competing. When I got back from the last Games I realised what was missing. Growing up Bayside in Brisbane I sailed with all my friends, and then again in the 470s and other dinghies. We had a great laugh and I was missing that element. On Another Challenge Fitzgibbon’s seat moves to windward through the tack on a roller rail and cants when the boat is tacked. There are handrails throughout and his joystick controls a ram that manoeuvres the boat. Victoria and NSW are fielding strong state teams all vying for a rededicated championship trophy named after the much missed grandfather of Sydney 38 racing, Lou Abrahams, who passed away last year. His crew, some now racing with other 38 owners, are the defending national champions and his winning boat is returning to the start line with class newcomer, Chris Mrakas from Sandringham YC, at the helm. Weather dependent the racing will be run either on a course to the north of Scotland Island, Pittwater, or in the Broken Bay offshore zone. The RPAYC’s Steve Merrington is the PRO. 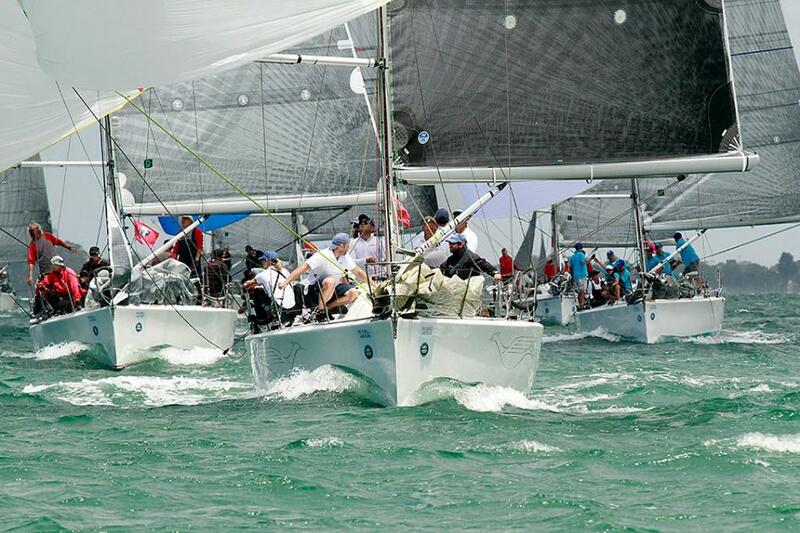 Up to four windward/leeward short course races are scheduled to start daily at 1100hrs. The presentation of awards will take place immediately after racing on Sunday February 22nd at the RPAYC. A number of sponsors are supporting the upcoming Sydney Yachts Pittwater Regatta including principal sponsor Performance Boating; gold sponsors Pantaenius Insurance, G- Brothers and Coca Cola; and silver sponsors Zhik, North Sails, 316 Fasteners, Quay Marine and Wettons.